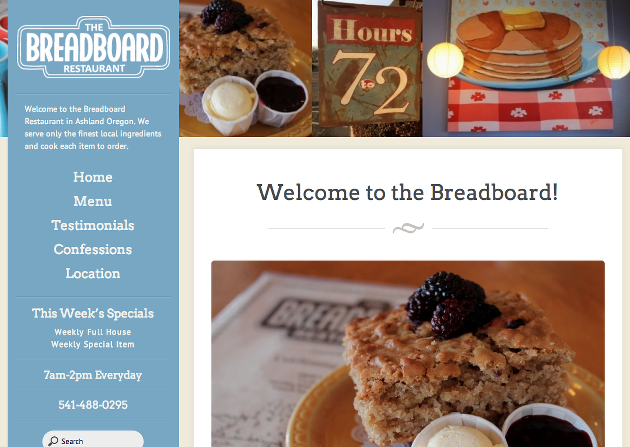 The folks at the Breadboard approached us to completely reinvigorate their website. Their location, Ashland, Oregon, has many popular breakfast locations and the Breadboard had only their pdf menu online. We installed and launched a complex WordPress template and created a more dynamic and strategic menu system (giving each product it’s own “page”) and really integrating their changing specials so their site is as updated and informative as any in the area. We are now working with them on search marketing efforts to really outpace the competition. “Sean has done a wonderful job updating our website. Not only was it out-of-date and difficult to navigate, but what was happening in the background was severely limited. He’s raised our profile on the internet and moved us miles ahead in tapping the marketing potential of the internet. Our site needed a refresher and an update. We needed someone that wasn’t just technical, but understood marketing. Sean is very talented in both areas and our site has become a crucial component of our marketing mix.” – Pete @ Breadboard Restaurant.